Let me hear about your current projects! 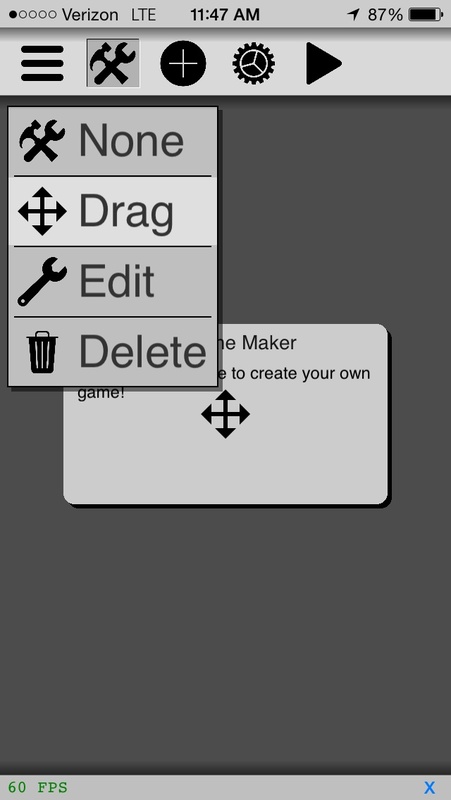 My current side project is a drag-and-drop game maker: http://i.imgur.com/cffDdGq.jpg I'm making it for a learning experience and for fun, I don't know if I'll ever finish it. I am currently working on an SAT score calculator. That image editor looks neat! Is it ready to share yet? Does it support saving to file yet, or is it just temporary? FileManager is my current project but it's not finished yet. Interesting. I actually made something similar, but not quite the same (filenav) a while back, if you should find parts of the code useful, feel free to use them. @Sebastion Wow I want this! My pixel art editor is coming along great! Needs some cleanup in the code, but I think I'll share it later today. @dgelessus: Thank you, very kind. WIP: but it's in the general direction. Openweather is convinced it only rains here. I'm using the Climacons set with their weather condition codes, it looks nice when I use another location so I see varied icons. @Dann that design looks fabulous. Working on a functional source line debugger for pythonista. Basically an extension of pdb that interfaces with a webview containing a syntax highlighting editarea, to highlight line of current frame. Got the bones working, need to get ui in order. @JonB Sounds potentially quite useful. BTW, when I just tried doing an import pdb and placing a pdb.set_trace() in a program, the program paused at the point of the trace and the console showed (pdb) but I was unable to use n to step through the program. Am I doing this incorrectly? Tried again with another script and it worked fine...strange. A UI for Shellista, currently only with basic command history buttons, but more to come. This may get pulled into transistor1's repo. And (not quite ready yet) a program/package manager-ish thing that supports un/installing of programs, optionally with multiple files, different install locations (e. g. site-packages), dependency installation, and primitive versioning and updating. The program metadata is downloaded from two JSON files currently hosted on my multipurpose repo, though additional ones can be added. (pythonista-scripts?) This is not meant to replace pipista, though I might integrate it at some point. .... 'Classes' a family of classes to: (1) support project development and delivery and (2) provide reusable building blocks to projects.